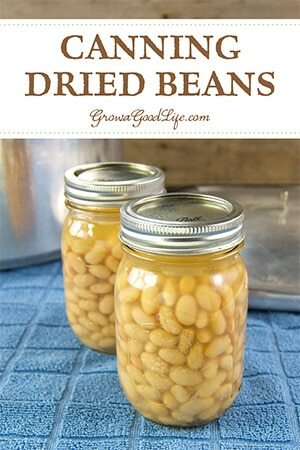 Pressure canning dried beans is a frugal way to add to your food storage. 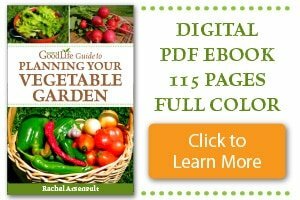 Reduce the sodium and chemicals found in commercially canned beans by canning your own. Beans are an inexpensive source of protein, and a great source of fiber, iron, vitamin B and C, and calcium. Having canned beans on hand makes it easier to include them in daily meals. According to The Bean Institute, dry beans are about one-third the cost of supermarket-canned beans. Canned beans also contain almost 100 times more sodium than dried beans according to NutritionFacts. Draining and rinsing the canned beans will reduce the sodium, but you are also draining away lots of flavor. Then there is always the issue of the chemicals in lining of the cans and that metallic taste. Canned beans are handy, though. It is much easier to open a can and add the pre-cooked beans to recipes. Also, dried beans should be used within a year after purchase. If dried beans are too old, they may stay hard after soaking and cooking. Canning dried beans can double their shelf life. Dried beans do take time to soak, pre-cook, and can, but you can prepare them ahead of time in large batches and have your own home canned beans in storage for those quick meals. When you can your own dry beans, you can use the flavorful bean broth in the jar instead of draining and rinsing it away. Plus you can control or even eliminate the sodium by canning the beans without salt. Salt is optional as a flavoring and is not required for safe canning. I like to can dried beans without salt, and then add salt to taste when preparing the recipe. Use your home canned beans to make New England Baked Beans, Roasted Garlic White Bean Dip, or any recipe that calls for canned beans. Use a Pressure Canner: Dry beans can only be canned safely using a pressure canner (not pressure cooker). When I began canning foods, I did some research and purchased, Presto 16-Quart Aluminum Pressure Canner. It holds a canner load of 9-pint or 7-quart size jars. Plus it is light enough for me to lift a full canner off the stove without help. Types of Dried Beans You Can Pressure Can: Black beans, chickpeas, great northern beans, kidney beans, navy beans, pinto beans, lima beans, and many others. How Much Will You Need? 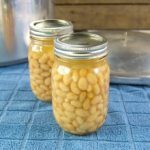 Since the processing time for canning dried beans is long, consider aiming for a full canner load so you don’t waste resources. The Presto 16-Quart Aluminum Pressure Canner holds 9-pint sized jars, or 7-quart jars. 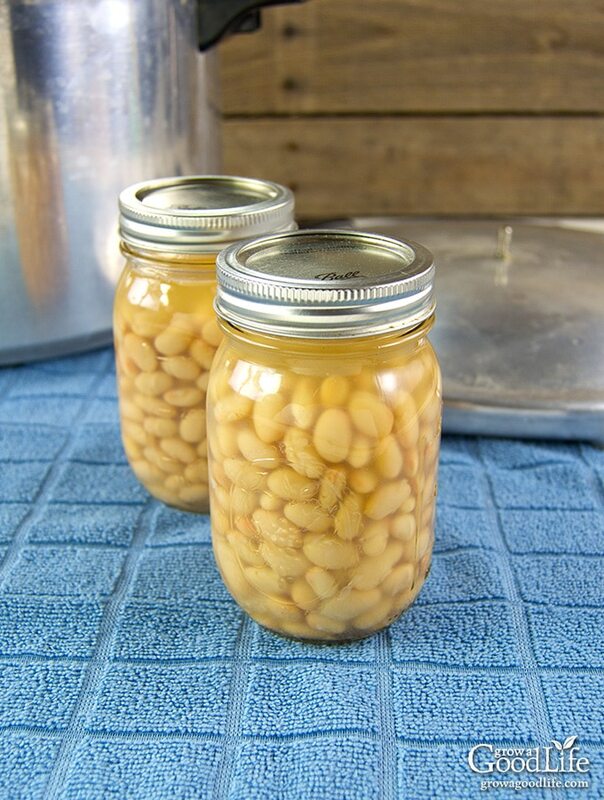 Depending on the type of beans you are canning, you will need about 3 1/4 pounds of dried beans to fill a canner load of 9 pint sized jars, or 5 pounds of dried beans to fill 7 quart sized jars. You can include jars of different types of beans in the same canner. A full canner load is a good way to add a variety of jarred beans to your food storage. Soak the Dried Beans: The National Center for Home Food Preservation recommends pre-soaking and simmering beans before pressure canning. Soaking dried beans helps enhance digestibility and nutrient absorption. Soaking also insures that your dried beans are rehydrated and will soften properly during cooking. 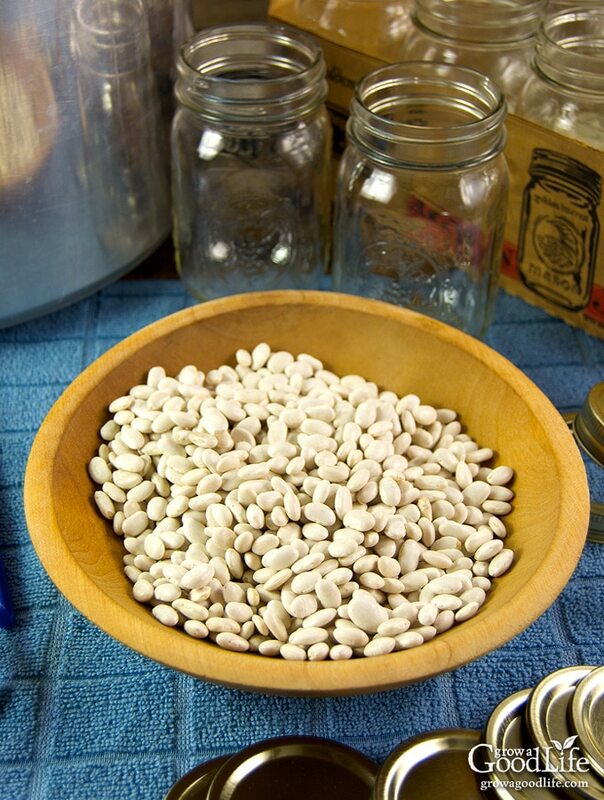 Soak Beans Overnight: Sort through the dry beans and pick out damaged beans and stones. Rinse the beans well and place them in a large pot. Add enough water to cover about 2-inches above the dried beans. Cover the pot and soak the beans in a cool area for at least 12-hours or overnight. 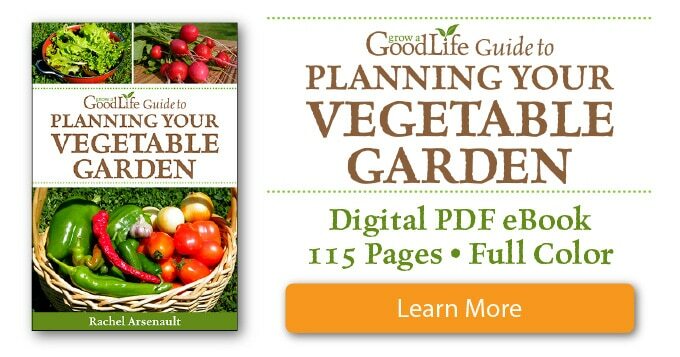 Go ahead and place the pot into the refrigerator if the weather is warm. Quick Soak Dried Beans: If you are pressed for time, you can use the quick soak method. Bring a large pot of water to boil over high heat. Add dried beans and boil for 2 minutes. Remove the pot from the heat and let the beans soak for 1 hour. Pre-Cook Your Dried Beans: Drain your soaked beans and rinse well with fresh water. Rinse out your large pot and add the beans back into the pot. Fill the pot with fresh water to cover about 2-inches above the soaked beans. Bring the pot to a boil over high heat and cook for 30 minutes. Reduce the heat to low and keep warm until you are ready to can. Your beans will still be firm. The beans will swell up a bit from soaking up water, and will finish cooking and soften when processed in the pressure canner. Prepare Your Canning Equipment: While the beans are cooking, gather your canning equipment, and prepare your jars. Prepare your jars and lids by washing in warm, soapy water and rinsing well. Place the jar rack into the pressure canner, set the clean jars in the canner, add water to the jars and fill canner to around 3-inches. Cover and boil jars for 10 minutes to sterilize. Warm your lids in a small pot of water over low heat. Keep jars and lids warm until they are ready to use. Fill Your Jars with Pre-Cooked Beans: Add the partially cooked beans to the warm jars. Add cooking water to fill jars leaving a 1-inch headspace. Run your bubble popper through the jar to remove air bubbles and wipe the rims. Add your lids and process your canning jars in a pressure canner. Sort through the dry beans and pick out damaged beans, sticks, and stones. Rinse the beans well and add them to a large pot. Fill the pot with enough water to cover about 2-inches over the beans. Cover the pot and soak the beans in a cool area for at least 12-hours or overnight. After soaking, drain the beans and rinse well. Rinse out your large pot and add the beans back into the pot. Fill the pot with fresh water to cover about 2-inches above the soaked beans. Bring the pot to a boil over high heat. Reduce the heat medium and simmer for 30 minutes. Stir beans occasionally to prevent sticking and add warm water if needed to keep the beans covered. Reduce the heat to low and keep the beans warm until you are ready to can. While the beans are cooking, prepare your jars and lids by washing in warm, soapy water and rinsing well. Place the jar rack into the pressure canner, set the clean jars in the canner, add water to the jars and fill canner to around 3-inches. Cover and boil jars for 10 minutes to sterilize. Warm your lids in a small pot of water over low heat. Keep jars and lids warm until they are ready to use. Spread a kitchen towel on the counter. Using your jar lifter, remove the warm jars from the canner, drain, and line up on the towel. If you are using canning salt, add 1/2 teaspoon of salt per pint or 1 teaspoon per quart to the jar. 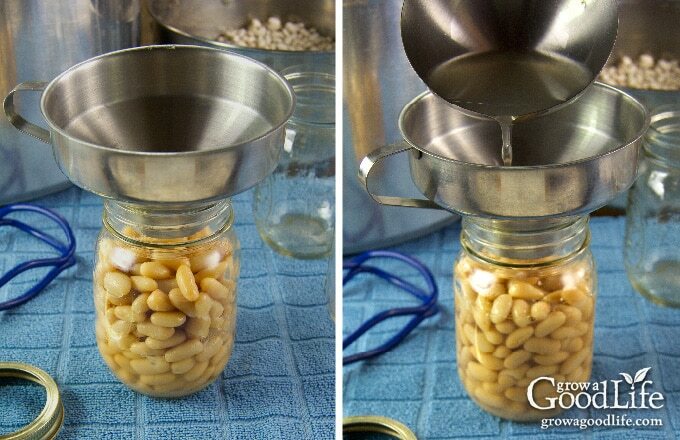 Using your canning funnel and ladle, fill the jars with beans. Add the bean cooking water, leaving 1-inch headspace at the top of the jars. Run your bubble popper through the jar to remove air bubbles and wipe the rims. Use your magnetic lid lifter to lift lids out of the warm water, center lid on the jar, and screw on band until it is fingertip tight. Using your jar lifter, place the jars carefully into pressure canner on the canning rack. Leave space in between the jars. Once the jars are all in canner, adjust the water level per your pressure canner’s instructions. If adding water, use the hot water from the small pot you used to warm your lids. Process pint jars of dried beans at 10 pounds of pressure 75 minutes at altitudes of less than 1,000 ft. Process quart jars of dried beans at 10 pounds of pressure 90 minutes at altitudes of less than 1,000 ft. Follow the directions for your pressure canner and adjust processing time for your altitude if necessary. When processing time is complete, turn off the heat and allow pressure canner to cool down on its own (approximately 1 hour). Remove the jars after the pressure canner has cooled. Spread a kitchen towel on the counter, unlock the cover of the canner, and remove it by tilting the lid away from you so that steam does not burn your face. Use a jar lifter to lift jars carefully from canner and place on the towel. Let the jars cool for 12 to 24-hours. You should hear a “ping” as the jar lid seal. After 12 to 24-hours, check to be sure jar lids have sealed by pushing on the center of the lid. The lid should not pop up. If the lid flexes up and down, it did not seal. Refrigerate the jar and use up within a few days. Once cool, remove the screw on bands and wash the jars. Label and date the jars. Store your jars in a cool, dark place and use within 12 months. Yields 9 pints or 7 quarts. If you don’t want to pressure can your dried beans, you can freeze them instead. Check out this article, 3 Ways to Cook Dried Beans from Scratch from our sister site. Are Canned Beans As Healthy As Home-cooked? Thank you so much for sharing this knowledge. I have a lot of dried beans in my food storage however I find I am to lazy and just end up buying canned beans at the store. I was able to can a bunch of them in one day! They taste way better than store bought and I love that I control the salt! Harmony, Thanks for your comment! I love canning dried beans without salt and then flavoring it to taste when cooking. This is such a good idea! I never thought about canning beans, but we use dried beans all the time. And sometimes, there just isn’t the time to cook dry beans. I think I need to make a bunch of pints of black beans asap!